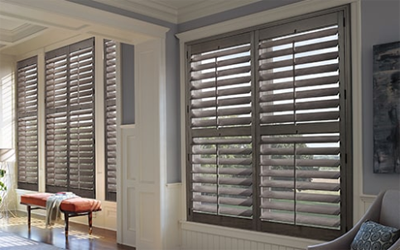 Blind and Drapery Showroom carries many high quality lines of shutters – offering shutters for every price point. But for the discriminating homeowner who wants only the “very best” nothing takes the place of authentic Hunter Douglas products. Renowned Hunter Douglas craftsmanship extends to their classic plantation shutters – manufactured in the USA from long-lasting materials and finishes. Hunter Douglas offers a wide selection of shutter materials – from moisture resistant Polystatin, to authentic hardwoods, to affordable composites. 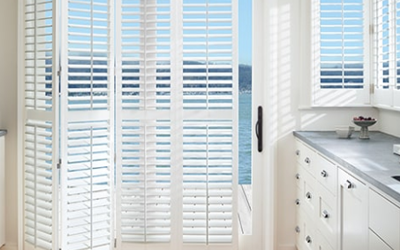 Every Hunter Douglas shutter is custom manufactured to your exact specifications. Available in louver (slat) sizes from 2.5 inches to 4.5 inches – and widths from 10 inches to 312 inches, Hunter Douglas has shutters for every window and door size. In addition to providing the ultimate in light control and privacy options, Hunter Douglas shutters are highly effective at insulating against California’s hot sunny days and cool nights. And, shutter’s cord free, child-safe operation makes them the ideal door or window treatment for households with pets and small children. Our interior designers will come to your Westlake Village, Agoura Hills, Calabasas, Malibu, Thousand Oaks and Ventura County home to help you choose the style, color, finish and price-point to fit your decor, lifestyle and budget. We will take exacting measurements to ensure a perfect fit – and return with your custom shutters for a courteous and hassle-free installation. Call us today for a free consultation! 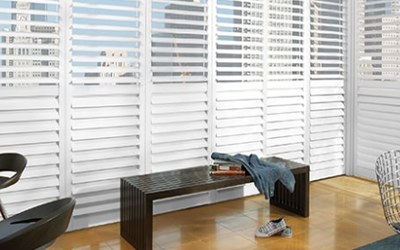 Hunter Douglas Palm Beach™ line of shutters offer the look of a finely-painted wood, but are manufactured from a durable, UV-resistant Polysatin. Palm Beach™ Polysatin™ Shutters withstand California’s intense summer heat, and harsh UV rays – and stand up to humidity without warping – making them ideal for the ocean or pool, as well as bathrooms, kitchens and laundry areas. Hunter Douglas guarantees Palm Beach™ Polysatin™ Shutters to never warp, crack, fade, chip, peel or discolor, regardless of extreme heat or humidity. Hunter Douglas Heritance® Hardwood Shutters are constructed from gorgeous hardwood, using sturdy dovetail construction. This offers the ultimate in elegance as well as long-term performance. Hardwood Shutters are also available in a wide selection of specialty shapes – including arches with sunburst or horizontal louvers. When you want “the best of the best” consider Hunter Douglas Heritance®. Hunter Douglas NewStyle® Hybrid Shutters are the latest innovation in “composite” shutters – marrying genuine wood with strong and durable synthetic polymers. These shutters are soil, spill and dust resistant thanks to the low-luster, micro-smooth, satiny FineTech finish. And dusting with a soft dry cloth is all that’s required, making maintenance a snap! The affordability of these beautiful, “hybrid” composite shutters makes Hunter Douglas high-quality available for almost any budget.